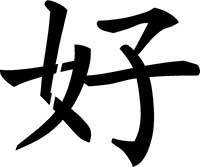 Chinese characters, this style of words are called logograms, Hanzi each character can be identified with a western word this image represents "Good". We have had to adjust some of the characters so they work as stencils. Also in Infinite Shapes we sell the characters as a set of pieces to make the character. This is just a small range of the Hanzi available please contact us if you would like any logogram that we have not got, you may need to help us with an image to get it right.